Review date: 19 June 2003. When those of us who own aluminium-cased show-off PCs have nightmares, the word we're most likely to scream as we sit bolt upright in bed, drenched with sweat, is "Beige!" Well, OK, possibly not. It's more likely to be something like "Insert System Disk?! Noooo!!". But drives with beige plastic front panels, unquestionably, do not look good against shiny brushed aluminium. 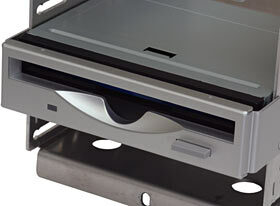 You can get black floppy and optical drives, which look passable in black aluminium cases and less awful than beige in silver ones; you can also get silver-fronted drives, but they're just silver plastic and never match the finish of a quality silver case. Clearly, the world needs black and silver drive fronts that look factory-fitted. These are Lian Li Lian Li aluminium bezels for 5.25 inch optical drives and 3.5 inch floppy drives. 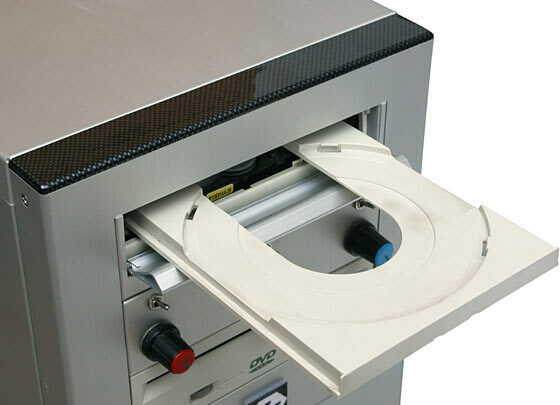 The floppy drive bezels should fit pretty much any drive; the optical drive bezels should fit any tray-load CD-ROM/RW or DVD-ROM/RW drive. Slot-load drives need not apply, but they've fallen out of fashion anyway. Lian Li have some typically uninformative product pages about them here, here and here; the floppy models are the F-01A and F-01B for silver and black, respectively, and the optical drive models are the C-01A and C-01B. Lian Li are including these bezels as standard equipment with some of their cases now, as well; this rather flashy one, for instance. Here in Australia, Aus PC Market are stocking the new bezels; the floppy models are $AU25.30 each including Australian delivery; the optical drive models are $AU27.50 delivered. Lian Li have had a go at this idea before, with the stick-on black and silver bezels I reviewed here. Those came in varieties to suit various floppy and optical drives, you can now get several more versions, to suit most of the world's tray-load drives. Aus PC Market list them all in their case mods section. None of the stick-ons quite match the finish of the cases, though. From some angles, they look perfect; from others, they looked weird. And their delivered price is more than 20 Australian dollars. These new bezels may not cost a lot more, but they're serious aluminium fabrications. This means they aren't likely to fit any cases other than Lian Li's; the old stick-on models suit any brushed-finish case. Apart from that, though, the new bezels look promising. 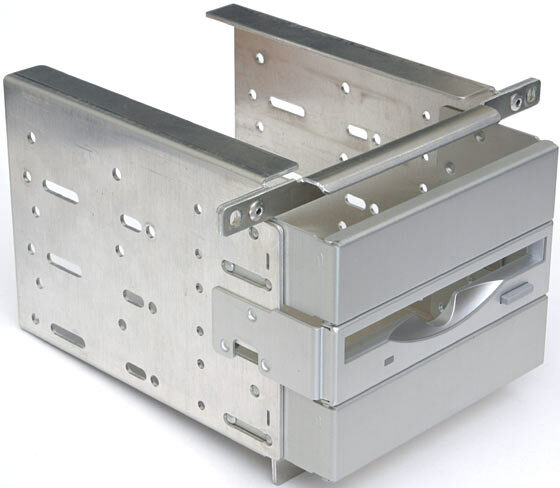 You should be able to install the new bezels in any midi-tower Lian Li case. The 5.25 inch ones use mounting holes that aren't present in other Lian Li models, or anybody else's cases that I know of; you could drill the holes yourself, but you'd want to make sure you got them straight. The floppy bezels want to be installed in a standard Lian Li middle-three-drives mounting cage; they'd be trickier to adapt to something else. If you've got a Lian Li midi-tower, though - and a lot of people have - then you should be fine, no matter how old the thing is. The original model PC-60 - as reviewed almost three years ago - that's sitting in the corner of my office passed the test. Fitting the case is one thing, though. Fitting the drives is the tricky bit. If these bezels were drop-in replacements for the plastic bezels that're already on the front of the drives then there'd be no problem, but they're not; there are too many drive bezel variations for that to be practical. Instead, these new bezels mount in front of the drives, which retain all of their standard plasticwork. This creates problems. The floppy drive bezels are simple enough. They've got a sprung plastic button thing that transfers your finger-push to the drive's actual eject button, and they've got a slot to match the drive's slot, and a notch out of the slot to allow you to poke the disk in. With the aluminium bezel in front of the drive, it's hidden deep enough that you need the notch. 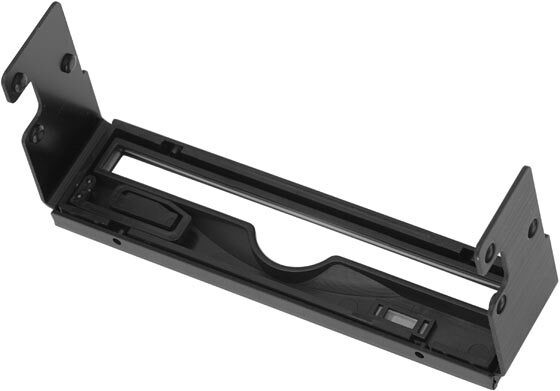 PC cases that have floppy slots moulded into their front panel often aren't notched enough, making it quite difficult to use the drive at all. This is the centre 3.5 inch drive cage from the PC-60USB in which lives my very own primary everyday advanced productivity workstation. 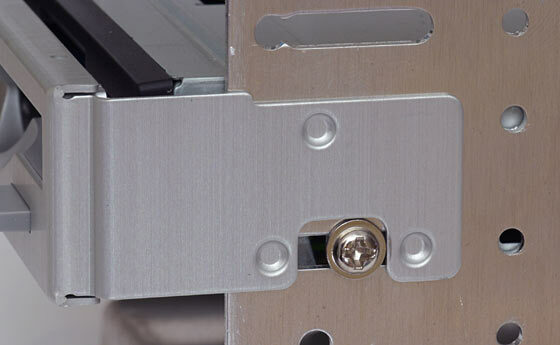 The F-01 bezel clicks, without screws, into the same mounting holes as the standard drive bay covers, except it engages them from the outside, instead of the inside. This leaves room for a drive to be screwed in as normal. Early Lian Li cases had screw-mount drive bay covers, but they've been using these neat click-in arrangements for some time now. The holes have remained the same; click-in covers and bezels should work with the old screw-in cases. The finish of the new silver bezel isn't quite a perfect match for my PC-60USB's case's own finish, but I've been using this case for a year and a half, now; it's probably darkened a bit since new. Installing the drive isn't difficult; you can do it with the bezel in place. Everything screws in as it normally would, except the drive's rather further back than it used to be. 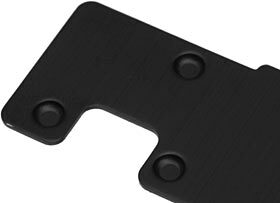 ...and install the drive so that the flanges on the front screws just touch the back of the slots in the bezel's mounting tabs, like this. This places the drive pretty much perfectly. Well, it did for me, anyway. 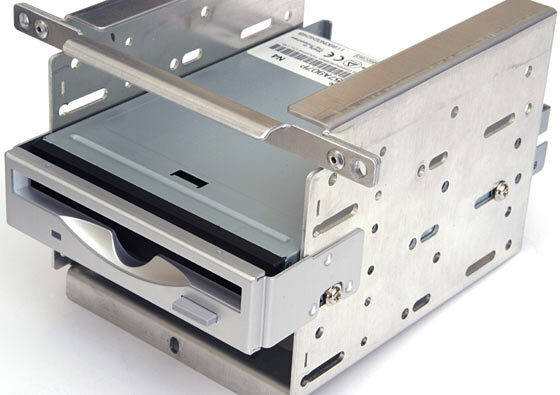 Standard floppy drives have all been pretty much the same shape for years, now. They're all Teacs or Mitsumis with practically identical front panels. This one's got a black plastic bezel, but is otherwise unremarkable. This standardisation means the eject button on an F-01 is practically certain to line up right without any mucking about, and so will the translucent plastic light guide that lets the floppy drive's activity light be seen through the new bezel. The light guide eats enough light that the activity indicator isn't likely to be very noticeable, but this isn't likely to ruin your day. What might ruin your day is if your floppy drive doesn't actually work after you install the bezel. But I'll get to that in a moment. The C-01 5.25 inch bezels are fancier than the floppy ones. 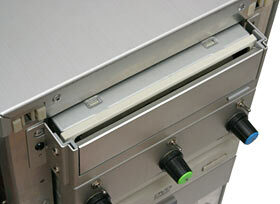 These bezels have a flip-open door, designed to be pushed open by the ejecting drive tray. The door's made from a cleanly finished piece of extruded aluminium, and it's spring-loaded; I unhooked the little spring (at the far end) so the door would stay open for this picture. The C-01s have another sprung button-pusher widget, but nothing else that matches up with any of the other stuff that may adorn the front of the drive - lights, play/pause button, volume control or headphone jack. You also lose the ability to access the little hole on the front of the drive into which you can poke an unbent paper clip to pop the tray out manually. There's nothing stopping case modders from making some more holes, of course; aluminium's very easy to work with. I wouldn't like to have to thread a paper clip through the bezel and into an eject hole, though. The mounting system for the 5.25 inch bezels is very simple. 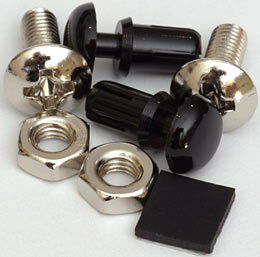 You get all this stuff in a baggie with the bezel, but the black plastic split-pin fasteners are all you ought to have to use; the nuts and bolts are a fallback strategy, and the little square black thing is a bit of self-adhesive rubber that you can stick onto any awkward drive buttons to allow the bezel's button-pusher to engage them more easily. The split pins fit holes on either side of the drive bays which, as mentioned above, Lian Li midi-tower cases probably all have, and which other cases probably all don't. Neither of these bezels was quite a plug-and-go proposition on my PC, but I got them both to work well without too much fiddling. The floppy bezel was the most treacherous. As per the last, mysterious letter in this column, putting stuff in front of your floppy drive can cause great irritation, if you end up with a floppy eject button that's gently pressed all the time. That'll cause the drive to stop working. The Lian Li bezel definitely wouldn't cause this problem if I slid the floppy drive all the way back, which'd mean screwing it in place with its front mounting screw flanges overlapping the tabs of the bezel. That'd be the least of the problems, though; with the drive that far back, you can't eject the disk without pushing the button right in, as mentioned above. With the drive further forward, so that the screw flanges don't clamp down on the bezel tabs, the bezel button was pushing slightly on the floppy button. As a result, the number of times the drive thought a disk was "not formatted", when it was, increased. This drive has that problem sometimes anyway if you don't prod the disk in firmly, but the bezel made it worse. To fix the problem, you could build up the bezel's eject button on the outside of the case, so that the drive can be mounted further back without the button having to be pushed past flush on the bezel to eject the disk. This would be difficult even if you didn't care what the result looked like - and you do care, or you wouldn't be using one of these bezels in the first place. Fortunately, there's a simpler solution; changing the bezel eject button's mounting location so that the button's shifted forward a bit relative to the bezel and the drive. That takes the pressure off the drive button, but keeps the drive location the same, so you don't need a longer bezel button to eject the thing properly. This turned out to be easy to do, because the bezel's eject button is a separate piece of plastic that's a press-fit on two little pins. ...shown in detail here, and the job is done. You can halve the thickness of the end of the tab without weakening it too much. 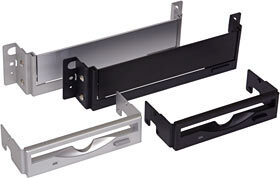 The Lian Li floppy bezels definitely aren't seriously misproportioned; they don't press hard on the button of my PC's drive, and I'm sure they'll work fine with no modification at all on many PCs. Well, I'm sure they won't make the floppy drive any worse than it is already, anyway; floppy drives are cantankerous things at the best of times. Particularly these days, when they commonly go unused for weeks or months on end and then, when it becomes clear that Only A Floppy Will Do for some task or other, get fed whatever dusty disk you could find down the side of the couch. If you get an F-01 and your drive suddenly stops working, though, be aware that you may be able to solve the problem with a nail file. OK. On to the CD-ROM bezel! Installing a C-01 is very easy, especially if you remember the basic trick for using expanding split-pin fasteners; pull the central pin that expands the split part out completely, stick the split part in the hole by itself - because now it's as narrow and squishable as it can get - then poke the central pin in and squash it down hard. Easy. The new bezel fit neatly over the tray-load CD-RW drive in my case; all I had to do was loosen the drive's mounting screws and slide it back to make room. And hey presto, I had a drive that couldn't eject! Fortunately, I hadn't pushed the middle pins into the expanding fasteners yet, so I removed the C-01 again, and investigated the problem. The standard flip-down door on the front of the drive was fouling the bezel's own door, despite the drive being as far back as I could move it. So I removed the standard door. 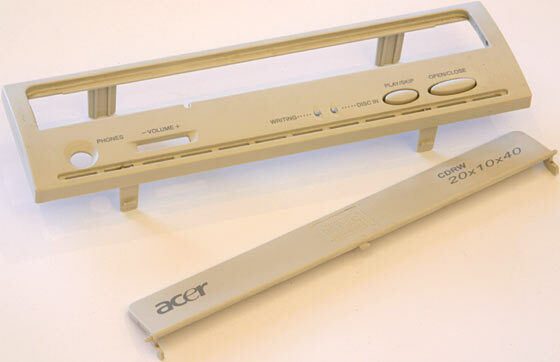 Here's the plastic bezel from the drive, with its door dislodged. This was very easy with this drive, and is likely to be just as easy with any other current model. Front bezels on tray-load drives these days are probably going to be held on with plastic clips, top and bottom. You undo the clips by pushing down on the latching part, through the hole in the drive case that it latches into, with a small screwdriver or similar implement. With any luck, you'll only have to do this to the latches on the top or the bottom; the other ones should let go when the first ones are out and you tilt the bezel forward. 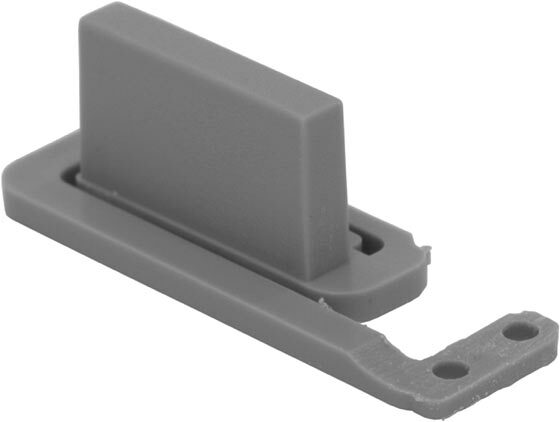 When you've got the bezel in your hand, you'll probably find that the front door hinge is just a couple of simple little pins that sit in sockets in the frame of the bezel. Bend the front door like a bow and the pins slip out. This whole process is easily reversible, too, provided you don't lose the little spring that pulls the door closed. This little spring, like all little springs that are part of a disassembled mechanism, will leap into another dimension the moment you take your eyes off it. 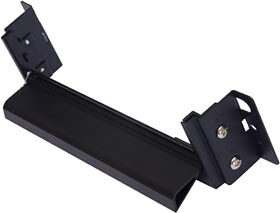 Removing the front door ought not to turn the drive into a dust-trap; most drives have a second door, not part of the bezel, to help keep gunk out. That door, plus a Lian Li bezel, should be just as good as the standard setup. The door-less drive works fine with the bezel..
...and the new aluminium door makes a musical little sound when the tray opens and closes. The PC-60's own front bezel is a very snug fit around the C-01A. I installed the new bezel in the top drive bay to see if its door would snag on anything, but it doesn't. You have to lift the case's bezel up a bit as you push it into place, but that's easy to do. The C-01A's door stands a little proud of the front of the case, but it pretty much looks as if it's meant to. The DVD drive's still beige, because it's a slot-load unit and, frankly, I don't really care. But everything else looks sweet, mate. As drive-hiding tricks go, these are good. 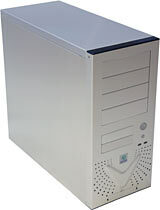 They certainly beat doors that you have to open to access the drives at all, like the ones on the Atlas SF-860G I review here, the AOpen H500W I review here, and the numerous variations on the popular Chieftec theme. 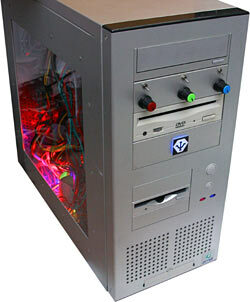 Doors are fine for computers whose drives aren't often accessed, as may be the case with a lounge-room PC built in a case like the Cooler Master ATC-620s I most recently checked out here, but if you want to use the drives a lot, the Lian Li option wins. To kit out a case with a couple of these bezels - one floppy, one optical drive - you're looking at $AU52.80, delivered. You'll only pay around $AU40 for a black or silver (plastic) fronted floppy drive; CD-RW drive prices are sneaking down towards the $AU100 mark. Half the price of a new CD-RW drive just to make a couple of other drives match your case may seem excessive, but if you've bought a Lian Li case in the first place, you've at least partly done it because the things look so cool. 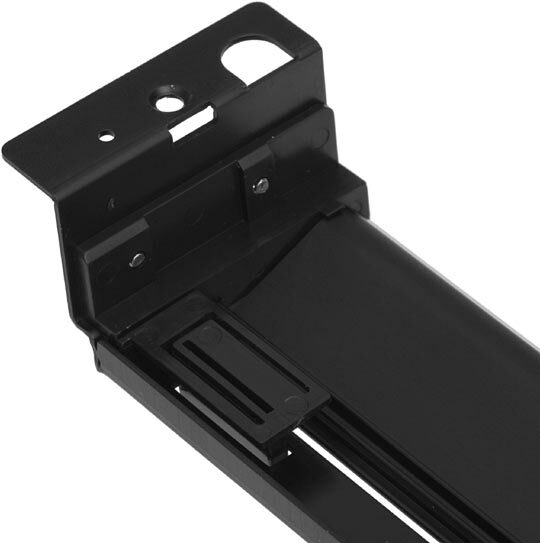 Practically, Lian Lis are really only marginally better than quality steel cases that cost half as much, and they're not better at all if you don't mind your PC weighing a couple more kilograms. But Lian Lis look great, and with these bezels, they look greater. As after-market upgrades, or as standard equipment with new Lian Li models, the C-01 and F-01 bezels get the drive-hiding job done about as well as anything could. Readers from Australia or New Zealand can purchase the F-01 (floppy) and C-01 (optical) drive bezels from Aus PC Market. F-01s are $AU23 including Australian delivery; C-01s are $AU27.50 delivered. Find the silver F-01 here, the black F-01 here, the silver C-01 here, and the black C-01 here. Lian Li's PC-6010 is another fine piece of show-off hardware.